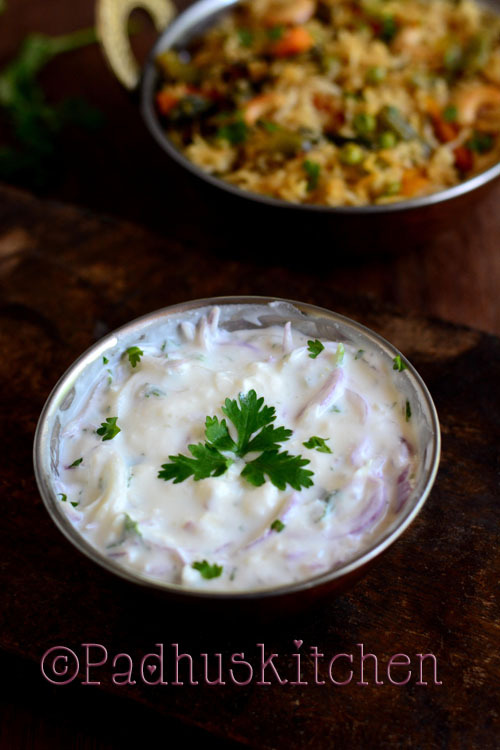 Onion Raita or Pyaaz ka Raita is a very simple, quick and refreshing dish made with yogurt and onion. It is a great accompaniment for any biryani or pulao. I love to have it even with parathas. You can prepare it in just 10-15 minutes. Today we will learn how to make onion raitha following this easy recipe. Peel the skin and cut onions thinly lengthwise. Finely chop green chillies and coriander leaves. In a bowl, combine together onion, green chillies, curd and salt needed. Mix well and garnish with finely chopped coriander leaves. That's it. No seasoning required. Note - Curd should not be sour. Learn how to make curd at home.